Research shows that parents are critical for the normal brain development of children. 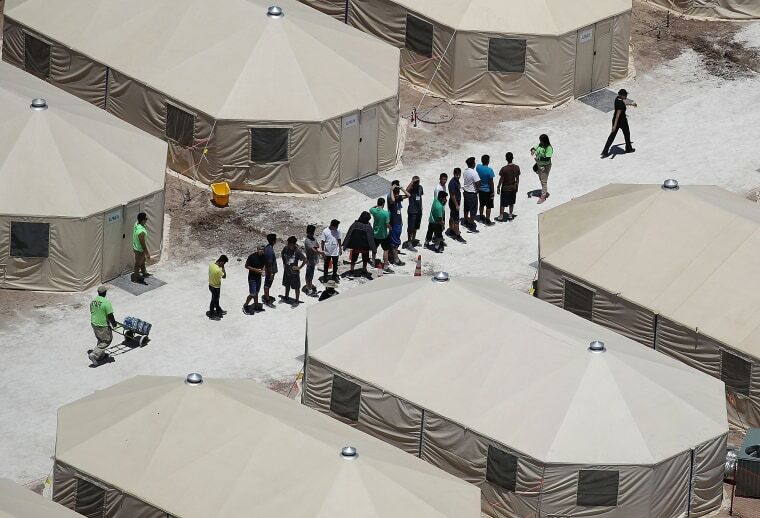 Images of children lined up in tent cities, living in deserted Walmarts, or crammed together into cages are horrifying child development experts, who say the kids are suffering severe trauma. They are a reminder of why the United States no longer has orphanages, several experts told NBC News. And, they say, there is no excuse for it. “This is one of the most significant traumas that a child can experience,” said Nim Tottenham, who studies child brain development at Columbia University. Tottenham should know. She’s researched children adopted into U.S. families from orphanages in other countries and said the trauma can be very difficult to overcome. “Once a country has the means, they abandon institutional care because it is known that this is not a great way for children to grow up,” Tottenham told NBC News. The Trump administration has given several reasons for the new policy, but critics from Republicans in Congress to governors from both parties have said it’s not a legal requirement and denounce it as immoral. More than 2,300 children have been taken from their parents at the U.S. border with Mexico since early May, and put into facilities including "tender age" shelters for the littlest children. Pediatricians, internal medicine specialists, family practitioners, the American Medical Association and public health organizations have all said taking children away from their parents does permanent damage to them. Nathan Fox, a child development specialist at the University of Maryland, sees similarities to the notorious orphanages found in Romania after the 1989 revolution there and the downfall of dictator Nicolae Ceaușescu. At least 100,000 children were found in the network of orphanages, the product of strict anti-abortion, anti-birth control policies. “The way to ameliorate these affects is to reunite the kids with their parents." Fox has followed some of these children and tracked their development, and says there are parallels with the border detention centers. The conditions in Romania were much worse than the conditions of the large warehouses where the border children are, but there is a common element, he said. American Academy of Pediatrics president Dr. Colleen Kraft has described how she saw toddlers crying hopelessly as workers in one center insisted they were not allowed to touch or comfort the children. Massing the children together in the centers is an extremely harmful situation, Fox said. Some supporters of the policy argue that this treatment is no different from separating the children of people convicted and imprisoned for crimes. But it’s not the same, said Dr. Julie Kaplow, director of the Trauma and Grief Center at Texas Children’s Hospital. For one thing, the separations at the border are sudden, unexpected and often violent. When a parent is convicted of a crime, there is time for a child to adjust to the separation, Kaplow said. Plus, the children of U.S. citizens convicted of crimes are not put into institutions, which were eliminated for young children in the U.S. long ago, Fox said. If a child is abused or neglected and if child protective services gets involved, the child is placed in a foster home. "Whatever your criticisms are of the foster care system in this country, it is not anything like the situation into which the children currently are being placed," Fox said. President Donald Trump called the situation “sad" on Monday. Sad isn’t the issue here," Tottenham said. “The issue is, this is a trauma inflicted on children in order to deter their parent’s behavior," she said. The children have already been through a dangerous journey to the border, and many, if not most, of the families are fleeing violence, crime and other dangerous conditions in their home countries. Protests against Trump's family separation policy held around the U.S.
Kaplow said that in many cases, the detentions centers are "worse than what they experienced in their home country." The research is clear, Fox said. Traumatizing and institutionalizing children is harmful. “This is an issue for which there is no debate in the science about the effect -- the negative effects on children’s cognitive, social and psychiatric development,” he said. If a child is young enough, brain development is damaged and their brains can be smaller and more disorganized, the experts said. Parents are critical for normal brain development. It doesn’t have to be a biological parent, but human beings have evolved to need intense, one-on-one care in early childhood, Tottenham said. “Parents are doing a whole host of things to our brains, regardless of what their parenting styles are,” Tottenham said. On a genetic level, Tottenham said, studies have shown that children raised in institutions have damage to structures called telomeres, which are the caps on the ends of chromosomes. “You can see that those telomeres, which weather naturally as we get older, seem to be weathering at a greater rate in children who experience early childhood adversities,” Tottenham said. Plus, contact with a parent or other trusted caregiver helps a child turn off the stress hormones that flood their brains and bodies. Kids separated from parents can’t do that as well, Tottenham said. The long-term effects include anxiety and depression, impulse control and attention deficit disorder. For kids whose parents have died or abandoned them, putting them into a loving foster home seems to help, Tottenham and Fox say their work has shown. The solution is even simpler for the border kids, Kaplow said. “The way to ameliorate these affects is to reunite the kids with their parents,” she said.